This Strawberry Ice Cream recipe is made with ripe strawberry which gives it a lovely strawberry flavor at its best. 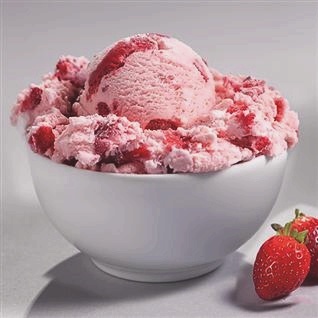 Related Ice Cream Recipe – Strawberry Ice Cream Recipe version 2. Slice strawberries, coat with 1/4 sugar and lemon juice. Stir and let sit for at least 1 hour. Beat egg yolks; beat in sugar. Heat creams together until steaming. Stir into egg/sugar mixture. Cool. Just before adding to ice cream machine, mash strawberries and stir into cream/egg mixture. Notes: Try to use *very* ripe strawberries for this recipe. If strawberries less ripe, increase sugar (to at most 1 cup total). this recipe is super delicious. very easy to make and family love it very much. gonna mke this one again and again. for more delicious recipes visit http://www.gourmandia.com and http://www.gourmetrecipe.com. Enjoy!